I work with ESL/EFL publishers to produce quality instructional materials. 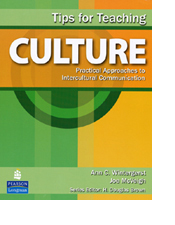 I’m the co-author with Ann Wintergerst of Tips for Teaching Culture: Practical Approaches to Intercultural Communication published by Pearson Longman. Learn more about this book or purchase online direct from Pearson Longman or Amazon.com. You can also preview the Table of Contents and the first chapter of the book here. If you are in the People’s Republic of China, a Chinese translation is available from Tsinghua University Press. 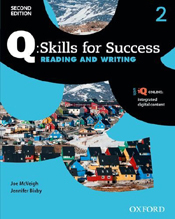 I am also a co-author with Jennifer Bixby of two books in the Oxford University Press series Q: Skills for Success, now in its second edition. We wrote Book 2 in the reading/writing strand and also the Introductory level reading/writing book. You can learn more about the entire series from OUP. If you are interested in a historical perspective on materials writing, you can preview the original online components of the books in the series from 2012. Occasionally I write for hire. For instance, I wrote the Lesson Planner (Teacher’s Edition) for a recent edition of WorldLink 3 from Heinle Cengage. In addition to writing, I occasionally work as a freelance development editor. That means that I assist authors in taking their initial ideas and turning them into completed manuscripts, helping the writers create texts to suit the needs of the publisher. I worked as development editor on the following books. 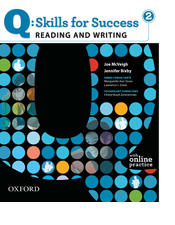 McCarthy, M., McCarten, J., & Sandiford, H. (2012) Viewpoint 1 Teacher’s Edition. New York: Cambridge University Press. Lee, L., et. al. (2010). All Star 3 Teacher’s Edition. New York: McGraw-Hill. McEntire, J., & Williams, J. (2008). Making Connections Intermediate: A Strategic Approach to Academic Reading. New York: Cambridge University Press. Renn, D., & Iannuzzi, D. (2008). Hemispheres 4 Teacher’s Manual. New York: McGraw-Hill. Manheimer, R. D. (2007). 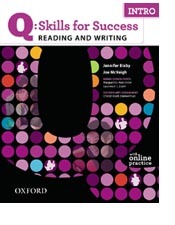 Mosaic 2 Reading Teacher’s Edition (5th ed.). New York: McGraw-Hill. Wegmann, B., & Knezevic, M. (2007). Mosaic 2 Reading (5th ed.). New York: McGraw-Hill. Gardner, P. S. (2006). New Directions Teacher’s Manual (2nd ed.). New York: Cambridge University Press. Leaney, C. (2005). In the Know: Understanding and Using Idioms. New York: Cambridge University Press. Gardner, P. S. (2005). 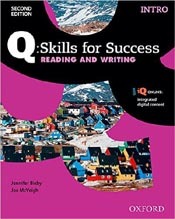 New Directions: Reading, Writing, & Critical Thinking (2nd ed.). New York: Cambridge University Press. Most of my development editing work has been for Cambridge University Press , Macmillan, and for McGraw-Hill. I’ve also written reviews or participated in focus groups for Oxford University Press, the University of Michigan Press, and for earlier incarnations of Pearson and National Geographic Learning. As a teacher and academic coordinator at intensive English programs, I created many courses and designed curricula over a fifteen-year period. I have also worked in curriculum development as part of my consulting practice. I’ve worked with electronic delivery and online instruction, giving advice to GlobalEnglish.com, DynEd International, and Laureate Education, Inc, in addition to writing a portion of the online materials for Q: Skills for Success.